It's been five years since we reviewed this British production, so now that it is on DVD, I want to call it to the attention of new readers. Those looking for something different in a Christmas video should consider this BBC/CNN news approach to the events surrounding Christ’s birth. The intrepid reporters of "Jerusalem Central" cover virtually all the aspects of the Nativity – the religious, the political, economic, and scientific. The last involves interviews with astrologers, the leading "scientists" of the time. The profile of "the mad tyrant" Herod sounds like the kind of capsule report we might hear on CNN. There is enough material in this 90-minute video for a three or four-session Advent study. An exciting presentation that makes the coming of Christ all the more relevant. Suitable for high school youth and adults. Bethlehem Year Zero it's the birth of Jesus and surrounding events as TV news would have covered it today. A mad tyrant Herod, a turbulent restless people under Roman occupation, mass executions-all under the shadow of the greatest astronomical event in 800 years, at a time when astrology was the cutting age of political science. This programs sheds new light on the events and circumstances surrounding the birth of Jesus. This is an attempt to set Christ's birth in the real political and social context of the time based on the best available resources. Believably replicating a modern-day, fast-breaking news format using six 15 minute segments, this excellent, diligently - researched program presents the "good news" of Christ's birth in ancient Bethlehem. The Christmas story in six segments as TV news would report it today. "This is no nativity play treatment of Christ's birth but attempt to set it in the real political and social context of the time based on the best of the available resources and research. A mad tyrant Herod, a turbulent and rebellious people living under Roman occupation, mass executions- all under the shadow of the greatest astronomical event in 800 years, at a time when astrology was the cutting edge of political science." Though the news reporters use the birth stories of Jesus from the Bible, all scenes were filmed in present day Israel situations. An excellent way t tell and show the story of Christ's birth and surrounding events in a "You are there!" style. Highly recommended. Bethlehem Year Zero is a stunning new take on the Christmas story, presenting the events of 2000 years ago as if they were breaking news in the present. Based on research and the best resources, this outstanding video looks closely at the political turbulence of ancient Rome and its tyrannical occupation, with real political analysis of emerging threat to King Herod's rule. Divided into six 15-minute segments, Bethlehem Year Zero is an exciting and sobering view of the birth of Jesus Christ and its far-reaching implications. From Bethlehem, comes a special bulletin on the "Crisis in Palestine." 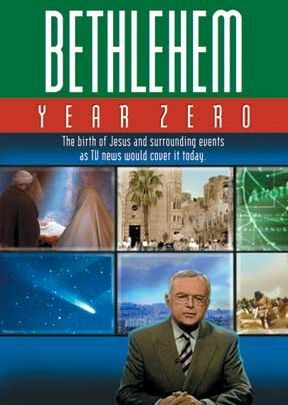 Faithfully replicating a modern-day news program, Bethlehem Year Zero presents events surrounding the birth of Christ to viewer in the form of fast-breaking news. From the observatory in Galilee comes word of a comet heading for Jerusalem, along with reports of a three man mystery delegation seeking a meeting with Herod. Journalist speculate about their identity as well as news concerning a pair of "miracle pregnancies" (Mary, a virgin, and Elizabeth, a woman well into her 60's, are about to give birth?) And so the program continues, recounting events from an ancient perspective, right through to the massacre of the innocents and subsequent flight to Egypt. Of course, the real danger in this approach is the temptation so be "cute" and superficial, but that's not the case here: meticulously researched and scripted with minute attention to detail, this production features real depth and provides a genuine understanding of the birth of Christ within the political context of the times. Truly "Good News." Highly recommended! News junkies will thoroughly enjoy this fast paced six-part series of simulated newscasts covering the events surrounding the birth of Jesus. Complete with staccato signature music opening and closing each program and an authoritative news anchor switching back and fort to reporters in the field, this British production might be as convincing as Orson Welles' famous radio broadcast were it to be aired by a station during Christmas week. There are 90 minutes of programs in all, each segment being 15 minutes long, jammed with pertinent facts about he life and times of Herod and his Roman masters. The scenes of Jerusalem and Bethlehem, however are not costumed re-enactments, but shots of the teeming streets of Palestine today. Thus, when it is learned that three foreign dignitaries have arrived at Herod's palace looking for the whereabouts of the new King of the Jews, it is three black stretch limos that we see outside a lavish building. later, with diplomatic flags fluttering on their fenders. it is these limousines that we see in Bethlehem, and then departing hastily from the country. These contemporary scenes add to the sense that this is indeed an authentic news broadcast that we are watching, with late-breaking news breathlessly reported by hard working journalist. What would it look like if Jesus was born in the 21st century? This video answers that question in a nontraditional, yet creative manner. A very good presentation of what the news might have been 2,000 years ago in Bethlehem. Except for one serious flaw. Joseph is depicted as an older man with other children. This helps perpectuate the myth put forth by the religion of Rome which claims Mary was forever a virgin.